Once considered the bread of Scotland, oatcakes can be found in every Scottish store. Made with simple, natural and wholesome ingredients they are great for breakfast, lunch or as a snack. When you emigrate to the other side of the world there are many things you can miss. For me, that is family and friends. Others miss places, culture, memories, the weather or food. To be honest, in my two and a half years living in Australia, I haven’t craved or missed many foods from Scotland….that was until now. This week I had some serious craving for Haggis! I kept seeing Instagram photos of Burns Suppers and I felt a little nostalgic. Haggis wasn’t something I wanted to attempt to make myself, so I decided to prepare a different Scottish food, (oatcakes), to celebrate Burns with the boys. Five batches later, I finally made an oatcake that reminds me of home. Every country seems to have their own selection and names for different varieties of oats. This can make oat-based recipes confusing and is why, sometimes, recipes don’t translate well from country to country. Many oatcake recipes simply state oats in the ingredient list. No other explanation is given and yet the type of oat you use can greatly affect the end result. From my research, I discovered that Scottish Oatmeal is most commonly used. This isn’t something that is stocked in the supermarkets here, so I experimented using the more commonly available, rolled and steel cut oats. A little breakdown of the oats I discuss. Rolled Oats – Are created by steaming and rolling oats. 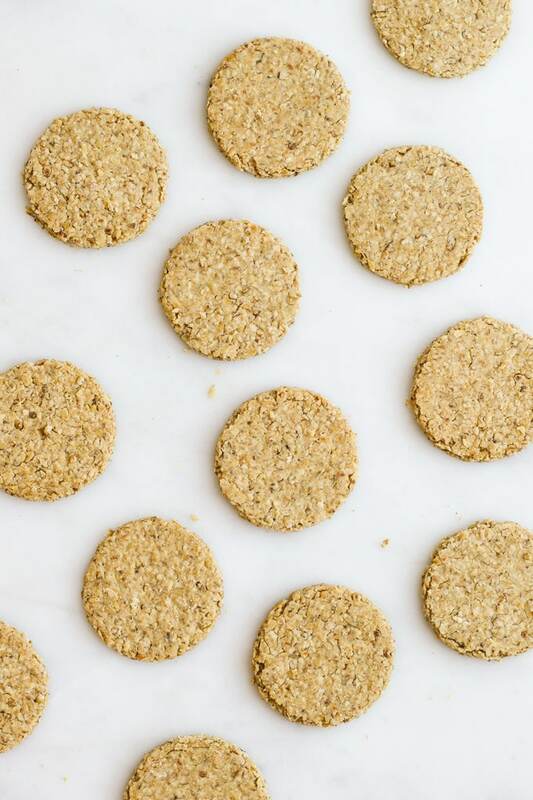 When developing this recipe I tried making the oatcakes with steel cut oats, rolled oats and a mixture of both. 100% steel cut oats (blended) – The mixture was a little crumbly to work with but it produced a good, textured, rough oatcake. 100% rolled oats (blended) – The mixture was easier to work with but the finished oatcake lacked in texture. 50% steel cut / 50 % rolled mix (both blended). This was voted the favourite from both my kids and my husband. 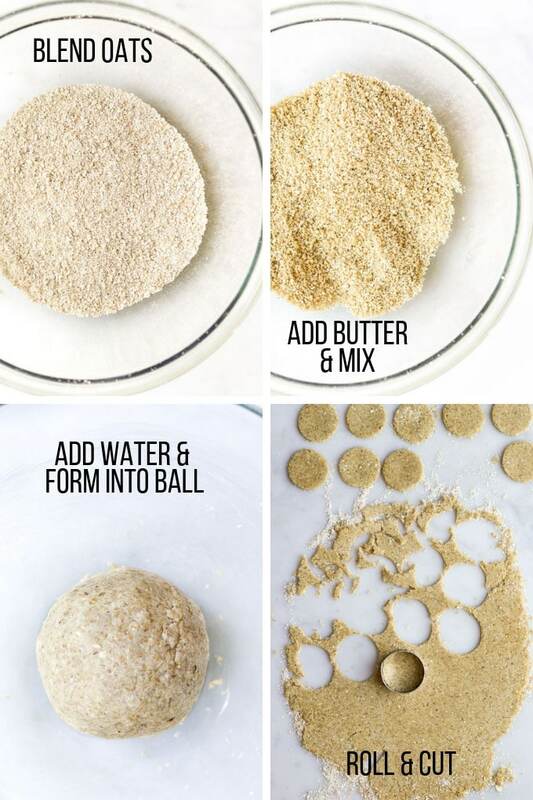 If you can get your hands on some medium oatmeal, then you could use this and no blending would be required. Once you have the oats all figured out, the recipe is pretty simple. With very few ingredients, they are easy and quick to prepare. Many oatcake recipes include baking soda or baking powder. I’m not sure of the reasoning behind this. Without an acid to react with the baking soda, it won’t do much, and you don’t really want the oatcakes to rise. However, I did decide to try the recipe with baking powder to see if there was any difference. There wasn’t any noticeable difference in texture but the batch baked with baking powder were slightly darker in colour. I chose not to include baking powder in my recipe card but if you wish, you can add 1/4 tsp to the recipe. What Do Oatcakes Taste Like? When I told my youngest that we were going to make oatcakes, his face lit up. He just heard the word cake and was imagining an indulgent, sweet treat. When he saw and tasted the finished product, his face fell. It was not a cake as he knew it! Perhaps a bit of history will give a better understanding of what to expect. Oatcakes, in Scotland, have been a staple diet since the 14th Century. Historically, oats were the only grain to withstand the harsh weather conditions of the Highlands and when Scottish Clans were travelling, it is reported that Soldiers would carry a sack of oatmeal and a metal plate. They would heat the plate, on a fire, mix some oatmeal with water and make a cake. Definitely not something lavish or complicated! Nevertheless, they are, in my opinion, delicious and taste especially great with rich flavoured accompaniments. Although not keen to start with, (as he was expecting a cake), my youngest has managed to work his way through a great number of oatcakes, (from 5 batches worth), with and without toppings. What Texture Should Oatcakes Have? Oatcakes can vary widely in regards to texture. They can be rough to fine, depending on how the oats are ground. They can be slightly chewy, crumbly or crispy, depending on the water content, how thick they are rolled out and how long they are baked. This recipe produces an oatcake that is crunchy with a medium to rough texture. Gluten Free – Although oats are naturally gluten-free, most commercial oats are processed in facilities that also process wheat, barley, and rye. The gluten in these ingredients can contaminate oats. Make sure to buy gluten-free oats if intolerant. The great thing about oatcakes is that they can be enjoyed in many different ways and at any time of the day. Enjoy them with sweet or savoury toppings, crumbled into soup or as part of a cheese board. Below I have illustrated nine different ways you could top your oatcakes, of course, this is just nine of many ideas. The toppings are limitless. Have you tried this recipe? I love to hear your feedback, please rate and leave a comment below or tag me on Instagram. 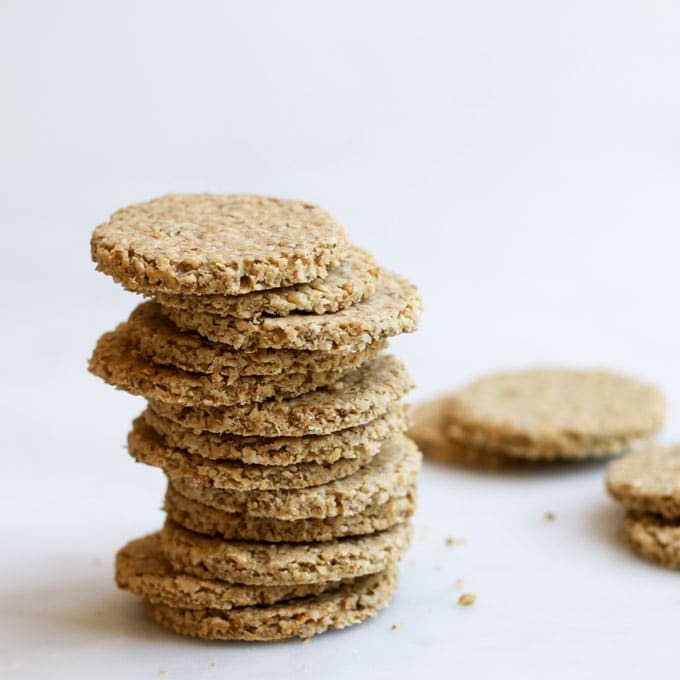 Made with simple, natural and wholesome ingredients these oatcakes are great for breakfast, lunch or as a snack. 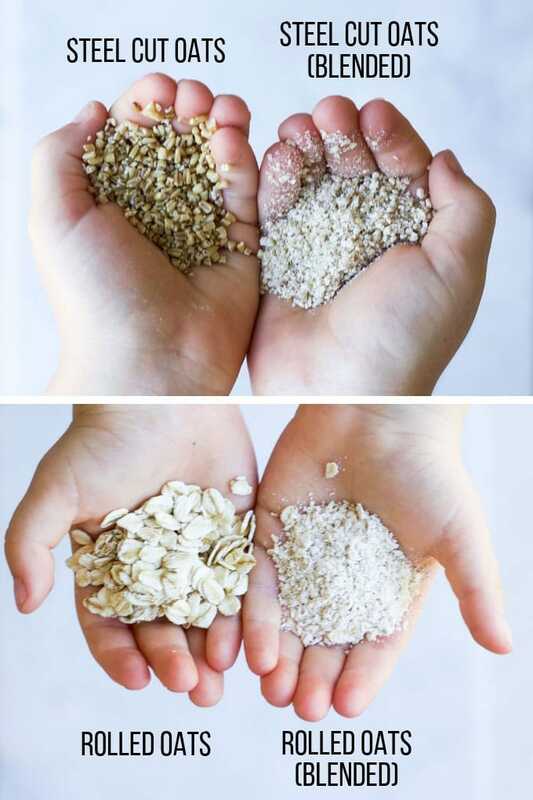 Add the rolled oats to the blender and continue to blend until they also represent coarse flour. In a large bowl, mix together the blended oats and salt (if using). Add the melted butter and mix through with your fingers. Form into a ball, sprinkle the work surface with some extra blended oats (or flour) and roll out to approx 3mm thick. See above post for information on oats. The type of oats you use, and how much you blend them, will affect the texture of your oatcake. This was our preferred combination and ratio. If you decide to change the oats, replace them by weight (total weight 190g), as different oats yield different cup measurements. You can replace the butter with a different fat (e.g olive oil) to make dairy free. The steel cut oats take a while to break down, I blended mine for around 5 mins. The rolled oats break down very quickly. I used 75ml of water. If the dough is too dry and not rolling then you may have to add a little more, 1 tsp at a time. 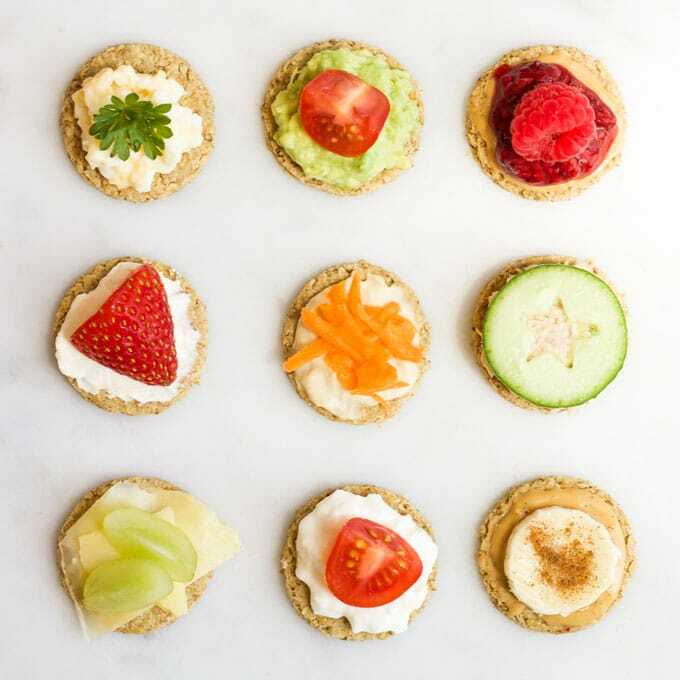 I made mini oatcakes as I find them perfect for kids, they pack into the lunchbox and are great for snacking on. Oatcakes are usually bigger than this. Hi Amy, I would like to try these. How did you store them? Have you ever tried freezing them?